I can keep my betta in a small bowl – or even the cup I purchased it in. You will frequently hear people say “Betta’s live in puddles in there native habitat – The small bowl on my counter is way bigger and better”. This is probably one of the most repeated misconceptions out there, and while Bettas can survive in small bowls or cups, it should only be a temporary location primarily for transport. The rule of thumb for most bettas is around 2.5 gallons for a single fish. I know many people will think that is huge for a betta, however your betta will live a much healthier and longer life in a tank of this size. There are a few reasons for suggesting a larger tank for a single fish, but the most important reason rests in the water quality it’s stability. Just like the quality of the air you breath can affect how you feel and live, the water in your fish tank can affect how your fish behaves, and its quality of life. The water chemistry you have in your fish tank/bowl has many properties that affect your fish directly, such and temperature, pH, and ammonia. While a betta can grow accustom to varying levels of pH and temperature its important that the water chemistry does not change too quickly as it will put stress on the fish. When you add food to the tank and it doesn’t get eaten, or when waste collects in the tank the water chemistry will change over time. When old food begins to decay, it will eventually raise the ammonia in the tank and enough ammonia will stress and could eventually kill your betta. This is the main reason for a larger tank, the larger volume of water the longer it will take any of the water chemistry to change allowing you more time to attend to the problems as they arise. A simple water change and cleaning out the detritus (junk in the bottom of the tank) will remove most of the ammonia and its source from the tank or bowl. If you are a breeder, beginner or advanced you will likely have much smaller spaces for your bettas. Successful breeders who do this understand the importance of water quality and have made the commitment to do weekly or even daily water changes to compensate for the small enclosures and to keep the water quality as pristine as possible. Many large scale breeder also create “Betta Barracks” which very in design, some of which actually circulate the water from each container through a sump where additional filtration and heating takes place. Betta’s are not beginner fish. Learn more about betta housing here. Betta’s do not need a heater. Yes betta’s do not need a heater… Well if your home or office never drops below 68°F that is absolutely true. Betta’s can live in temperatures ranging from 68°F – 84°F but thrive best in an ideal water temperature of 80°F. My betta vase is a self contained ecosystem and never needs fed. A few years back a popular trend was a betta vase, advertised as a “All in one, self contained ecosystem”. The idea behind this “ecosystem” was the plant would grow from the nutrients in the water and the betta would eat the roots of the plant. 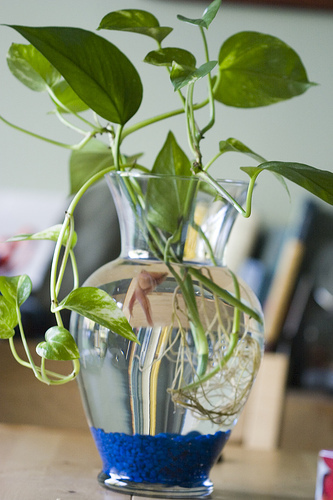 The betta’s waste would in turn provide the plant with nutrients. This sounds great in theory, and many people will find the “ecosystem” attractive, however, the setup has many flaws. First bettas are not vegetarians and they require protein in their diet and plants cannot provide that. Second, most of these setups are far to small in order to allow all the natural processes to take place to be fully self sufficient. Because of this, water changes are still required to keep up the proper water chemistry.